The new Carmel-Sutton United Methodist Church building sits among the trees on Pleasant View Road (just off Bashan Road). A photo taken during the first service at the church on Oct. 22 shows the congregation in front of the new building. The nursery area provides a place for the children to play and learn during the service, while those monitoring the nursery area can see the service through the window into the sanctuary. 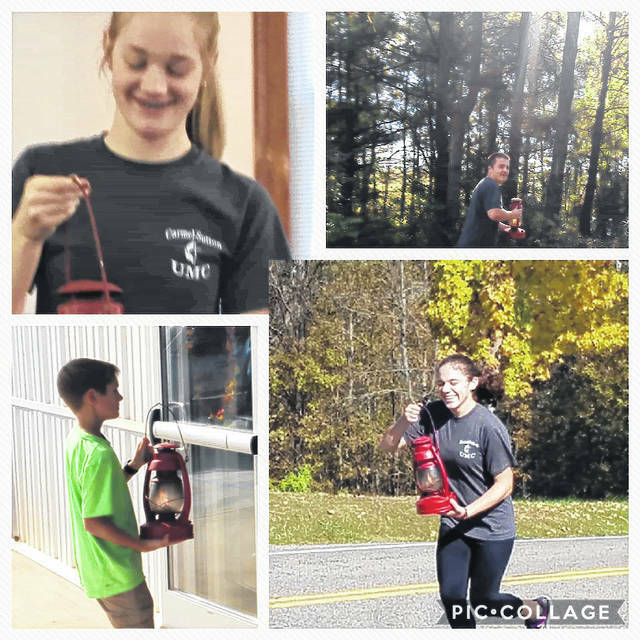 Four runners from the church, Allie Hanstine, Spencer Harrison, Mallory Johnson and Jake Roush, carried the flame from the old Sutton building to the new church as part of the transfer service on Oct. 22. 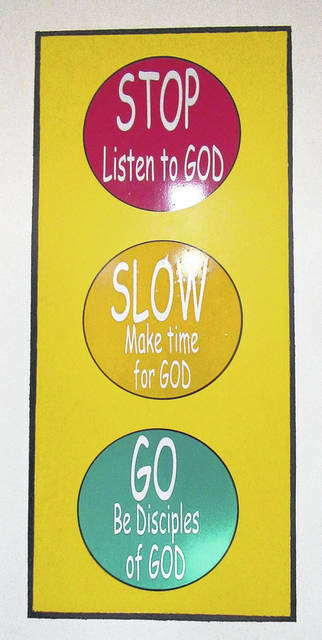 A painting at the end of the classroom hallway remind everyone to Stop, Slow and Go. Members of the congregation attend the first service at the new building on Oct. 22. An open house is to be held on Nov. 12. Pastor Jim Marshall speaks to the congregation during the first service in the new building. 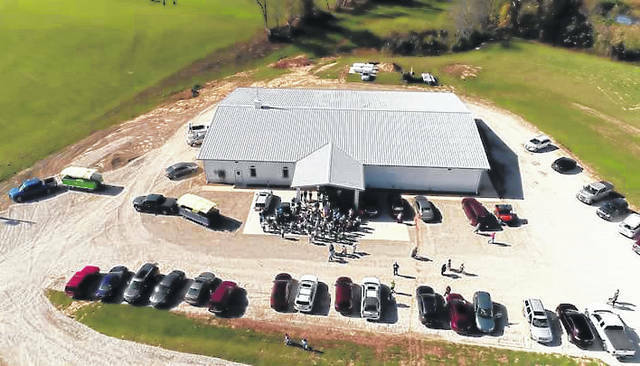 A drone photo shows a crowd gathered outside the new church for the first service. 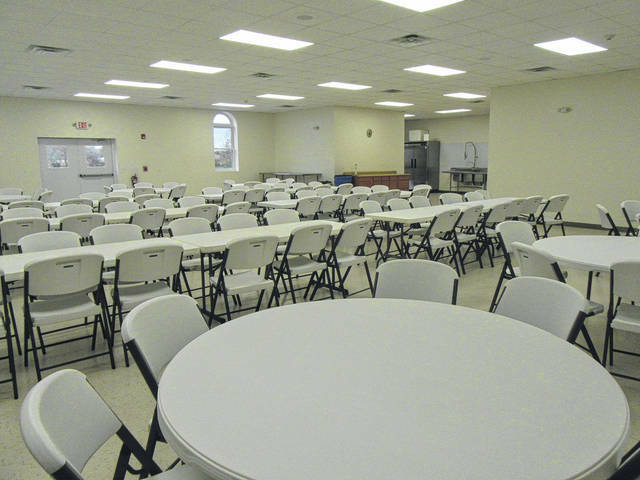 The fellowship hall holds seating for a large crowd, complete with a new kitchen area. RACINE — After more than four years of fundraising efforts and planning, Carmel-Sutton United Methodist Church officially moved into its new church building on Oct. 22 with a transfer of the flame from the Sutton building to the new church located just down the road. For many years, Carmel-Sutton UMC utilized two church buildings — the Carmel building on Carmel Road and the Sutton building on Bashan Road. For the past few years church service had been held at the Sutton building, while special events and the young adult Sunday School class had taken place at the Carmel building. Neither facility was large enough to accommodate the growing congregation, particularly at Christmas programs. Parking space was also an issue at the former locations. The move to the larger building means that all Sunday school classes can be held under one roof, as well as having space for programs and activities. “The transition brought tears,” said Kathy McDaniel. The process has taken some time and has seen the transition of pastors during the process with each contributing in their own way, explained McDaniel. Now, the church is settling in to its new location with an open house planned for Sunday Nov. 12 beginning at 10:30 a.m. with the church service. Lunch will be served until 2 p.m. that afternoon. Several former pastors are expected to be in attendance for the open house, while others have already toured the building. With seating for around 225 people in the sanctuary, there were 157 people in attendance for the first Sunday as the flame was carried by runners from the former church building to the new church building. Other events have already taken place at the church, including the annual apple butter making which was made easier by the direct access to the kitchen/dining area from the outside. Additionally, an entrance is located next to one of the adult classrooms to allow for easy parking right outside the door. While the majority of the building and the items in it are new and modern, there are aspects of the former buildings that have made their way into the new building. As you enter into the much larger entryway, above the door is a stained glass window from the Carmel building, along with the bell from the building. As the church made its transition on the morning of Oct. 22, the Sutton bell rang at the Sutton building, with the sound soon being replaced with the ringing of the Carmel bell at the new building. The lighted cross at the front of the sanctuary was crafted by Paul Hayes and Jeff Hill from woodwork which was around the windows in the Carmel building. “We don’t want to forget where we came from,” explained Kathy McDaniel. As they incorporated the old, there is also the touch of modern technology. While there are still song books at the chairs, songs and other items are put on screens in the stage area making it easier for people to see the large print on the screens if they would prefer. Looking forward to events and programs, the stage area is extendable, making for a walkway through a portion of the sanctuary and allowing for more people to participate. 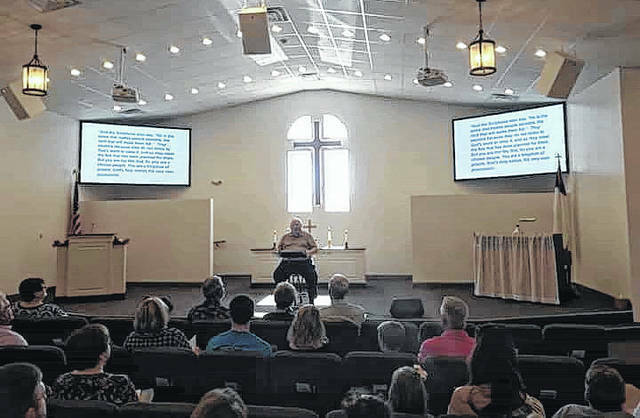 “It is a big leap to go from an 1800s building to 2017, there will be bugs to work out but it went well,” said Pastor Jim Marshall of the initial service in the church. Funding for the building took place with $300,000 in fundraising efforts, working with Farmers Bank on a loan, and a lot of “sweat equity” from the church. The United Methodist Church was also instrumental in helping with grant funding for the new building. 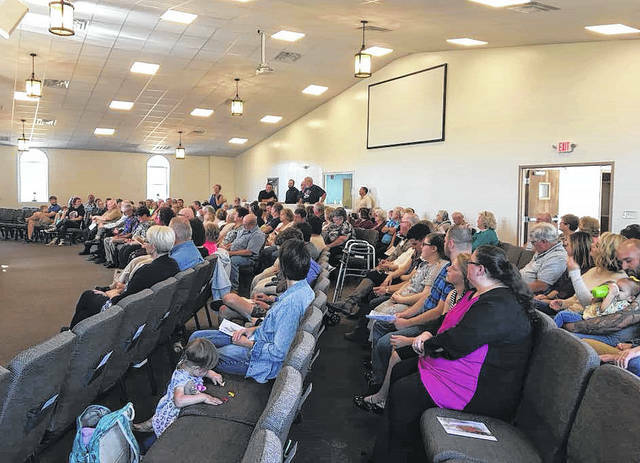 Currently, Carmel-Sutton is 15th in size out of the 167 churches in the Foothills District of the United Methodist Church. The building would have cost around $1 million to complete without that work by the congregation, but all told the church spent around $700,000, said McDaniel. It was a project that brought people together, explained Marshall and McDaniel. The church plans to continue with its community outreach and services, including building its third blessing box to serve areas of the community. As for the future of the former buildings, the Carmel building will ultimately be torn down, with the Sutton building being turned into a “new to you” thrift store as a way to meet a need in the community. “It is tough to say good bye to the old buildings, but we hope to fill this church and reach more for the Lord,” explained McDaniel. 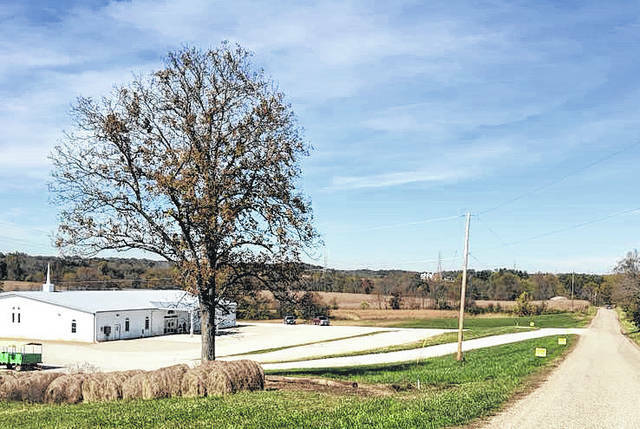 The new Carmel-Sutton UMC is located on Pleasant View Road just off of Bashan Road. 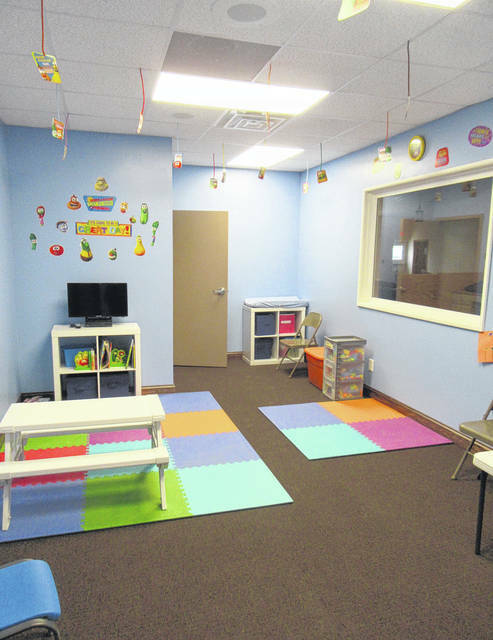 Sunday school is held at 9:45 a.m. each week, followed by worship service at 11 a.m. On Nov. 12, the open house and service will begin at 10:30 a.m.
https://www.mydailytribune.com/wp-content/uploads/sites/42/2017/11/web1_11.5-CS-12017113151721275.jpgThe new Carmel-Sutton United Methodist Church building sits among the trees on Pleasant View Road (just off Bashan Road). https://www.mydailytribune.com/wp-content/uploads/sites/42/2017/11/web1_11.5-CS-22017113151722798.jpgA photo taken during the first service at the church on Oct. 22 shows the congregation in front of the new building. https://www.mydailytribune.com/wp-content/uploads/sites/42/2017/11/web1_11.5-CS-32017113151723696.jpgThe nursery area provides a place for the children to play and learn during the service, while those monitoring the nursery area can see the service through the window into the sanctuary. https://www.mydailytribune.com/wp-content/uploads/sites/42/2017/11/web1_11.5-CS-42017113151726793.jpgFour runners from the church, Allie Hanstine, Spencer Harrison, Mallory Johnson and Jake Roush, carried the flame from the old Sutton building to the new church as part of the transfer service on Oct. 22.
https://www.mydailytribune.com/wp-content/uploads/sites/42/2017/11/web1_11.5-CS-52017113151728562.jpgA painting at the end of the classroom hallway remind everyone to Stop, Slow and Go. https://www.mydailytribune.com/wp-content/uploads/sites/42/2017/11/web1_11.5-CS-62017113151730846.jpgMembers of the congregation attend the first service at the new building on Oct. 22. An open house is to be held on Nov. 12.
https://www.mydailytribune.com/wp-content/uploads/sites/42/2017/11/web1_11.5-CS-72017113151732870.jpgPastor Jim Marshall speaks to the congregation during the first service in the new building. 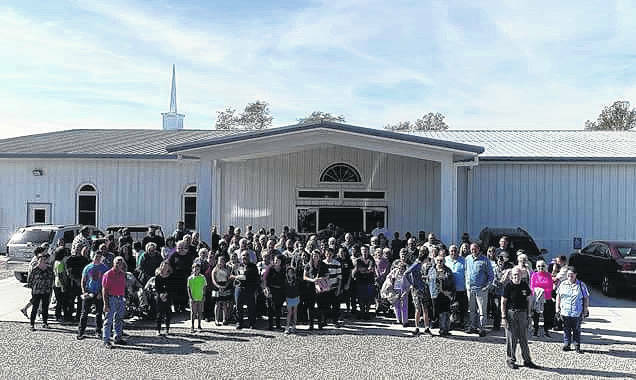 https://www.mydailytribune.com/wp-content/uploads/sites/42/2017/11/web1_11.5-CS-8201711315173574.jpgA drone photo shows a crowd gathered outside the new church for the first service. https://www.mydailytribune.com/wp-content/uploads/sites/42/2017/11/web1_11.5-CS-92017113151736772.jpgThe fellowship hall holds seating for a large crowd, complete with a new kitchen area.